These kits are housed entirely online. 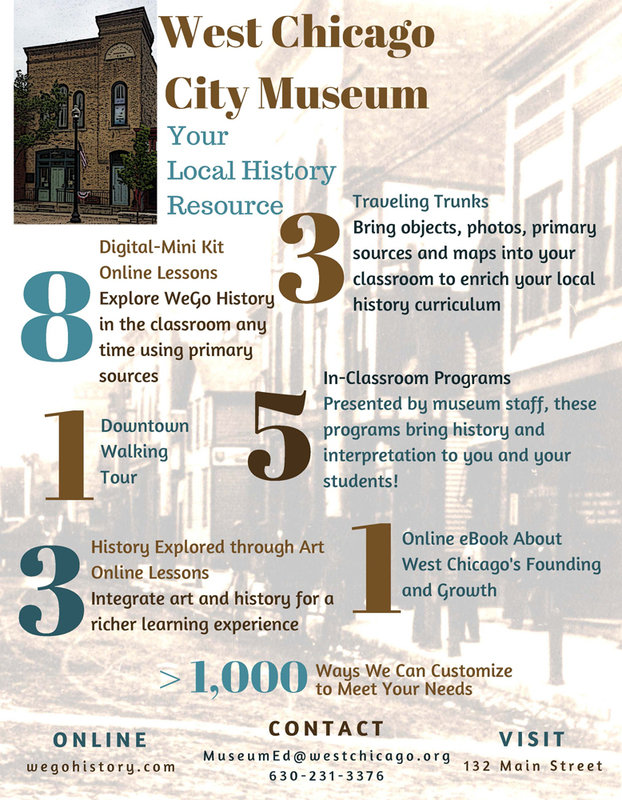 The purpose of these kits is to supplement your regular curriculum with fun activities that reinforce the concepts taught, while at the same time exposing students to the history of West Chicago. This DMK invites students to examine maps through the history of West Chicago, using questions to think critically about geography, the economy, the development of a new community, and more. This DMK gives a history of immigration through Castle Gardens and Ellis Island, tracking the arrival of two different people who eventually came to live in West Chicago. This DMK discusses how prairies were created, why northern Illinois was not originally considered a desirable place to settle, and how technology forever changed The Prairie State. This DMK provides an overview of Chicago history up through 1900, tying significant historical topics and happenings to parallel’s in West Chicago’s own history. This DMK was created specifically for Indian Knoll’s anniversary. It provides a fun look at how life for kids has changed in the last 50 years. Songs, hand plays, and historic photos work together to help students understand basic principles of economics and how they relate to West Chicago’s history. A brief photographic overview of West Chicago’s history. Slide notes allow teachers to give historic background behind each image. The train jobs song is a fun way to learn some of the jobs one could hold on the railroad. Traveling programs have been developed for school or youth groups and comply with state school curriculum guidelines and Boy Scout badge requirements. We can also host your group here in the museum for any of these programs. History Explore through Art (heART) is a fun and exciting interdisciplinary approach to West Chicago's history. Students are exposed to local history, art history + contemporary art, art-making processes, and creative self-expression. Lessons are grouped by age-level and can be adapted for use with a variety of media. Railroad History/"I Saw the Figure 5 in Gold": We take trains for granted now, but they were once new, fast, and exciting! They gave birth to the town we now call West Chicago, and many of the families that immigrated here in the 1800s built the railroads. Artists will use Charles Demuth's painting "I Saw the Figure 5 in Gold" as inspiration for creating an abstract artwork representing West Chicago's railroad history. Healthy West Chicago/Wayne Thiebaud: Looks at those delicious cakes! Gumballs! Ice cream cones! Thiebaud knows how to make sweets look delicious in his paintings. Artists will learn about West Chicago's history of healthy foods, and try their hand at creating an artwork where healthy food looks as delicious as Thiebaud's confections. (Click the title to download a PDF lesson). De la Tierra Somos¡No Somos Illegales! : Chicago-based artist Carlos A. Cortéz explored social and political ideas using printmaking as a way to share messages. In this lesson, artists learn about the history of Mexican immigration in West Chicago, and create their own "artwork with a message."